Most of the trails are open but there are a few areas with oak groves. Take U. S. Highway 59 to Edna, then State Highway 111 South for approximately 7 miles to Brackenridge Recreation Complex and Park. 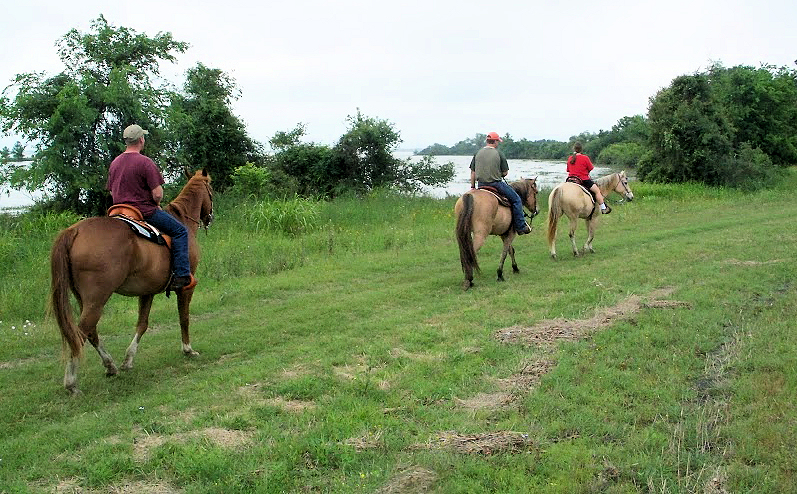 Please note that Brackenridge Park is right across the road from Lake Texana State Park (both clearly marked but just make sure you turn into the correct one, the State Park (sadly) doesn’t allow horses on their trails)! 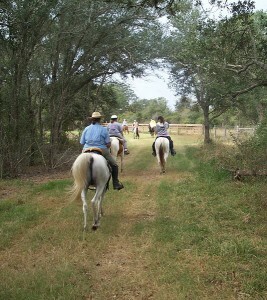 $7.50 per rider to ride trails, $15 a trailer to stay overnight, and $2 per horse for a stall overnight. Stalls are first come first serve. The terrain is all grassland, no hoof boots/shoes are needed. The parking/camping area for trailers is all gravel. Pens are spaced far enough apart to keep horses from bickering. There is gravel parking area at trail head and plenty of room for large rigs to easily maneuver. There are NO hookups and it is primitive camping only, but generators are allowed. 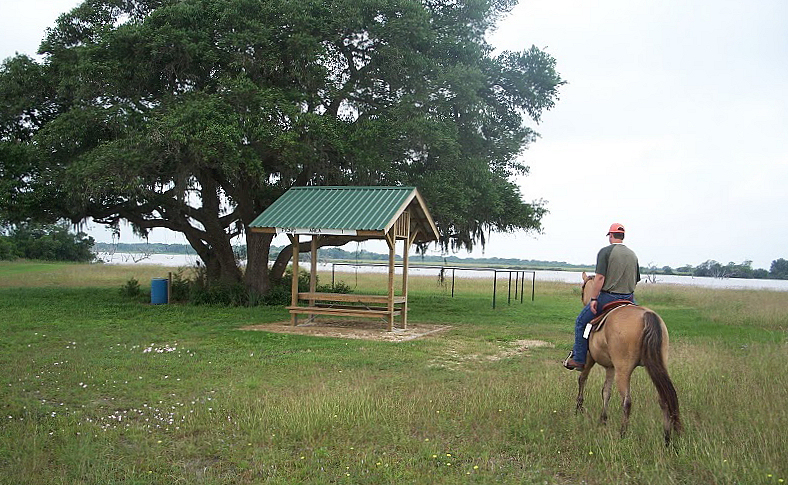 There is a water source available for watering horses at the trailhead camp but be sure to bring your own buckets. Quite a few horse stalls are available and also an arena/corral. There is no bathroom at the equestrian area, however a short drive around the bend is a bathhouse at the main camping area. New cabins (have kitchen area and bath in each one) are available to rent right around the corner, within walking distance to the horse pens, but they aren’t RIGHT next to the horse pens. The park rangers are good about driving through at night to check on things. I’ve known people to keep their horses at the pens and stay in the cabins with no problem. If you forget anything there is a small general store located at the park check in before you head off to the horse area. Above is the map link. The trailhead is located at the top of this map which is also where the horse camp is located. This map does not show the entire trail. You can see where the cabins are located (only the brown ones have been built thus far). Here is some info on a little known trail. This may not be the most exciting trail but it is on the lake and is a great park that offers many different things to make an enjoyable weekend trip for the whole family (even those that don’t ride!). The trail is 12.5 miles round-trip. However it is a switchback trail with approximately a 1 1/2 mile or so loop on the end. So you’ll ride about 4-5 miles, take this loop, and then end up on the same 4-5 miles back to camp. They had planned to add more trails initially, but wanted to see how much use it would get first. Unfortunately not many riders have shown up so they have not added on. It is still a nice scenic little trail and different than most trails as it is right on the lake so you get some nice breezes and pretty views. If you are a bird watcher you will enjoy this area! 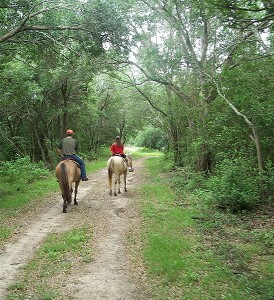 Most of the trail is out in the open with no shade (unfortunate in Texas during summer). There are a few wooded areas and tree shaded rest stops. The trail is an improved grass covered dirt trail, winding through open prairie and some oak groves. It is very flat with wide and even footing. In fact it is one of the only public trails I know of that is easily suitable for Driving buggies the whole way. Which also makes it excellent for a good gallop too! It’s not marked but you can’t get lost on this trail so a map is not even necessary. Call ahead for trail conditions since the trail is closed if the park receives excessive rain. 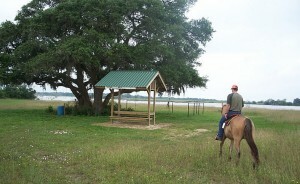 The Equestrian Camp area is secluded from the rest of the park. It is nothing fancy but does have some nice horse pens (I want to say at least 10, but I’m not 100% sure) and a small arena. Note that there is NO shade at the pens or trailer parking area. Off to one side of the camping area is a pretty tree covered grove next to a pond with a picnic table, water (area where you can wash off your horses as well), and possibly a BBQ pit. Something that makes this place unique is that the RV/Camping grounds are separate from the Equestrian area, but not too far away. Brackenridge offers many activities. They have playgrounds, a paintball course, mini golf course, bike trails, frisbee golf, a roped off swimming area, and fishing piers. It is a great place to go with kids and non horse riding family/friends so that they will have plenty to do while you go ride!